Gravure inks are fluid inks with very low viscosity. This allows them to be drawn into engraved cells in cylinders and then transferred onto substrates. In order to dry the ink and drive off the solvents or water, paper is run through gas fired or electric fired driers. The ink dries before the paper reaches the next printing station on the press. This is necessary, as wet inks cannot be overprinted without smearing and smudging. Therefore, high volume of air dryers are placed after each printing station. The gravure printing inks market has been gaining momentum across the globe due to the high-quality image reproduction and low per-unit costs offered by gravure printing. These inks have been extensively used in the packaging sector, which is expanding rapidly in many countries. Of late, the gravure printing inks market has been facing stiff competition from flexographic printing inks. Demand for flexographic printing in several countries in North America and Europe has increased significantly owing to the lower ink consumption, diminished manpower requirement, and faster changeovers of flexographic printing inks. However, gravure printing ink is still considered the preferred printing ink in the packaging industry. The gravure printing inks market has been segmented based on resin, technology, application, and region. In terms of resin, the market has been segregated into nitrocellulose, polyamide, polyurethane, acrylic, and others (including polyester, maleic, ketonic, and polyvinyl). The nitrocellulose segment dominated the gravure printing inks market in 2017. Nitrocellulose is a basic substance used for ink formulations in the mono- and bi-components form. The material is significantly used due to its advantages such as easy drying; film forming ability; low cost; heat resistance; solubility in alcohol-ethers mixtures, ketones, and esters; and dilatability in hydrocarbons. It has low odor, high degree of dimensional stability, and limited resistance to acids and alkalis. Based on technology, the gravure printing inks market has been classified into water-based, solvent-based, and others (including UV-curable). Solvent-based gravure printing inks are among the widely used gravure inks across the globe. This can be primarily ascribed to their ability to dry quickly and ease of adaptation on various substrates. On the other hand, water-based gravure printing inks are gaining momentum, as these inks comply with several environmental regulations. In terms of application, the gravure printing inks market has been divided into packaging, publication, furniture, and others (including wrapping paper, wallpaper, textile, and label). The packaging segment dominated the market in 2017. Demand for gravure printing inks in the furniture segment has been increasing significantly due to the growth in manufacture of products such as cabinets, ready-to-assemble (RTA) furniture, and flooring. Based on region, the global gravure printing inks market has been split into North America, Europe, Asia Pacific, Latin America, and Middle East & Africa. Asia Pacific is a leading consumer of gravure printing inks in the world. Rise in consumption of gravure printing inks in Asia Pacific can be ascribed to the increase in demand for these inks, especially in the packaging sector. India is one of the rapidly growing economies in the world. Enactment of favorable government regulations and emergence of medium and small enterprises have contributed significantly to the growth of the gravure printing inks market in India. Europe and North America account for large share of the global gravure printing inks market. Expansion of the market in these regions is likely to slow down due to the sluggish growth in end-use industries. The gravure printing inks market is dominated by large players. Key players operating in the market include Flint Group, DIC Corporation, Tokyo Printing Ink MFG Co. Ltd., Sakata Inx Corporation, Siegwerk Druckfarben Ag & Co. KGAA, Hubergroup Deutschland GmbH, Dainichiseika Color & Chemicals Mfg. Co., Ltd., and Wikoff Color Corporation. Gravure inks are fluid inks with very low viscosity. This allows them to be drawn into engraved cells in cylinders and then transferred onto substrates. In order to dry the ink and drive off the solvents or water, the paper is run through gas fired or electric fired driers. These inks dry before the paper reaches the next printing station on the press. This is necessary as wet inks cannot be overprinted without smearing and smudging. Therefore, high volume air dryers are placed after each printing station. The gravure printing inks market has been gaining momentum across the globe due to the high-quality image reproduction and low per-unit costs offered by these inks. Gravure printing inks have been extensively used in the packaging sector, which has been expanding rapidly in many countries. Of late, the gravure printing inks market has been facing stiff competition from flexographic printing inks. Demand for flexographic printing in several countries in North America and Europe has increased significantly owing to their lower ink consumption, diminished manpower requirement, and faster changeovers. However, gravure printing inks are still preferred printing inks in the packaging industry. The global gravure printing inks market has been segmented based on resin, technology, application, and region. In terms of resin, the market has been segregated into nitrocellulose, polyamide, polyurethane, acrylic, and others (including polyester, maleic, ketonic, and polyvinyl). The nitrocellulose segment dominated the gravure printing inks market in 2017. Nitrocellulose is a basic substance used for ink formulations in the mono- and bi-components form. The material is significantly used due to its advantages such as easy drying; film forming ability; low cost; heat resistance; solubility in alcohol-ethers mixtures, ketones, and esters; and dilatability in hydrocarbons. It has low odor, high degree of dimensional stability, and limited resistance to acids and alkalis. Based on technology, the global gravure printing inks market has been classified into water-based, solvent-based, and others (including UV-curable). Solvent-based gravure printing inks are among the widely used gravure inks in the world primarily due to their ability to dry quickly and ease of adaptation on various substrates. On the other hand, water-based gravure printing inks are gaining momentum as these inks comply with several environmental regulations. In terms of application, the global gravure printing inks market has been divided into packaging, publication, furniture, and others (including wrapping paper, wallpaper, textile, and label). The packaging segment dominated the gravure printing inks market in 2017. Demand for gravure printing inks in the furniture segment has been increasing substantially due to the rise in the manufacture of products such as cabinets, ready-to-assemble (RTA) furniture, and flooring. Based on region, the global gravure printing inks market has been split into North America, Europe, Asia Pacific, Latin America, and Middle East & Africa. Asia Pacific is a leading consumer of gravure printing inks in the world. Rise in consumption of gravure printing inks in Asia Pacific can be ascribed to the increase in demand for these inks, especially in the packaging sector. India is one of the rapidly growing economies in the world. Enactment of favorable government regulations and expansion of medium and small enterprises in India have contributed significantly to the growth of the gravure printing inks market in the country. Europe and North America account for large share of the global gravure printing inks market. Expansion of the market in these regions is likely to slow down due to the sluggish growth in end-use industries. The report analyzes and forecasts the gravure printing inks market at global and regional levels. The market has been forecast in terms of volume (kilo tons) and revenue (US$ Mn) from 2018 to 2026. The study includes drivers and restraints of the global gravure printing inks market. It also covers the expected impact of these drivers and restraints on the demand for gravure printing inks during the forecast period. The report also highlights growth opportunities for the gravure printing inks market at the global and regional levels. The report comprises a detailed value chain analysis, which provides a comprehensive view of the global gravure printing inks market. The Porter’s Five Forces model for the gravure printing inks market has also been included to help understand the competition landscape. The study encompasses market attractiveness analysis, wherein segments have been benchmarked by resin, technology, and application based on their market size, growth rate, and general attractiveness. 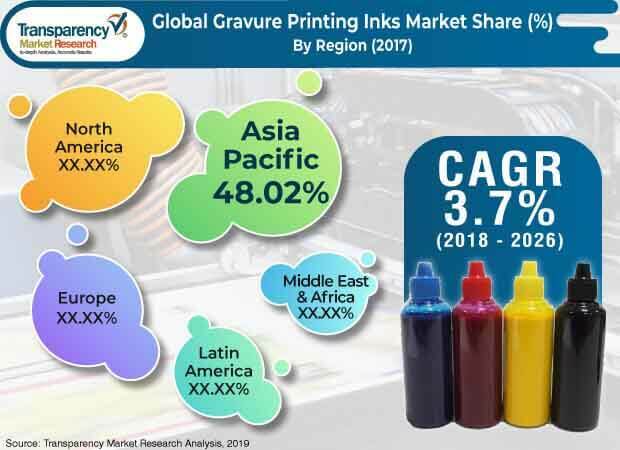 The study provides a decisive view of the global gravure printing inks market by segmenting it in terms of resin, technology, application, and region. These segments have been analyzed based on present and future trends. Regional segmentation includes current and future demand for gravure printing inks in North America, Europe, Asia Pacific, Latin America, and Middle East & Africa. The study includes profiles of major companies operating in the global gravure printing inks market. The gravure printing inks market is dominated by large players. Key players operating in the global market include Flint Group, DIC Corporation, Tokyo Printing Ink MFG Co. Ltd., Sakata Inx Corporation, Siegwerk Druckfarben Ag & Co. KGAA, Hubergroup Deutschland GmbH, Dainichiseika Color & Chemicals Mfg. Co., Ltd., and Wikoff Color Corporation. The report provides size (in terms of volume and value) of the global gravure printing inks market for the base year 2017 and the forecast for the period between 2018 and 2026. The size of the global gravure printing inks market has been provided in terms of volume and revenue. Market numbers have been estimated based on resin, technology, application, and region. The market size and forecast for each resin, technology, and application segment has been provided for the global and regional markets.